The main feature week continues to be a closed or “cut-off” low which will spin around somewhere in the central U.S., providing us with some chilly days for early May. Until that happens, the Ozarks will bask in more eighty degree weather today and temperatures nearly as warm on Wednesday. Expect today’s highs to reach into the lower eighties with no problem. Our lows this morning only dropped to about sixty on average. Wednesday looks warm again. A strong cold front will arrive late on Wednesday evening but the day looks great. Said front will generate some storms and rain in the Ozarks beginning Wednesday evening. I don’t think severe weather will be an issue with any storms that form. Thursday will be a drastic change for us! Much cooler for starters, as highs struggle to clear fifty on May Day. It will also be wet with a large area of post-frontal rain setting up. The pattern can be best described as cool and showery on Friday. Showers can’t be ruled out on Saturday either. After looking at the morning data, I think a storm chase is too problematic today. I talked about a “Quick Shot” tour today (not requiring an overnight stay) in my blog last night. This would only work on a “tether” of about four hours drive from Springfield. The area which would have qualified is from northeastern Kansas east into Missouri. While I acknowledge a lone supercell or two might form in this area, I think the bust potential is too high to justify a tour. 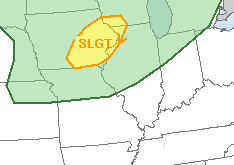 Other storms will likely form more northeast into Iowa and portions of Illinois. 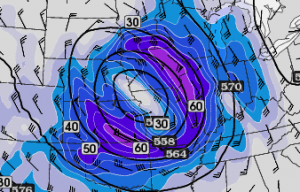 Again, discrete supercells might be hard to come by in this area. Like most storm chase decisions, there is a chance I’ll sit here at home and watch a storm form in just the right environment. In this case, I’ll be sure to give everyone an “armchair” chase! The Ozarks have three days of real Spring warmth before another substantial cold front plows through on late Wednesday. Today and Tuesday will feature a nice southerly breeze, plenty of sun and warm temperatures. The Ozarks should have no problem reaching into the lowers eighties on both days. Wednesday has the potential to be nearly as warm. A strong cold front will come through Wednesday night. it doesn’t look like a lot of showers or storms are possible out ahead of this feature. The main story in the forecast is the formation of a “cut off” area of low pressure which is forecast to churn very chilly air for the season around in the central U.S. starting late on Thursday and lasting into the weekend. This feature will keep temperatures very chilly for what will be early May. I expect highs only in the forties on Friday. Lows will commonly drop into the thirties from Friday morning through the weekend. The frost potential really depends more on wind and cloud cover, both of which are expected to maintain themselves to a certain extent through this period. Each morning will have to be evaluated. We also have a good rain potential with this stuck system. The heaviest rain will end up on the northern end of the low and so where it finally sets up will control the rain. 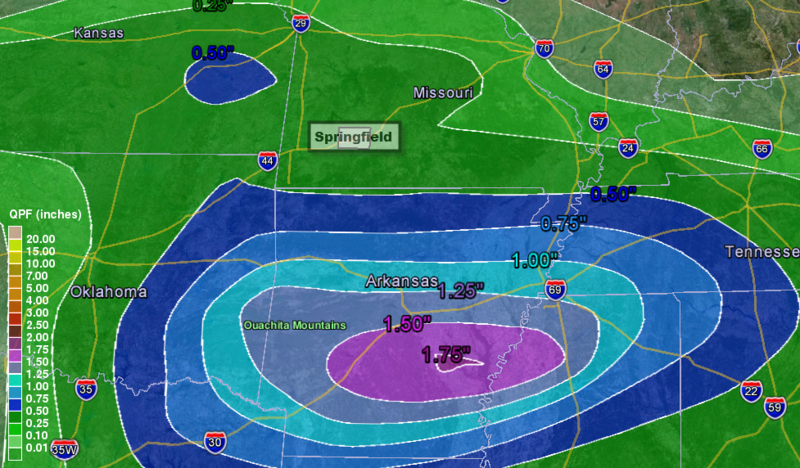 My feeling is that the Ozarks is due for .50-1.50″ rain totals from Thursday into a portion of the weekend. I have a new type of storm chase tour which doesn’t require an overnight stay and an opportunity may be coming up on Monday, April 29th. It’s all about distance from Springfield and terrain. If the drive is no more than four hours and the chase country acceptable, then I can take guests to the severe storm and have them back by late on the same day. Such a set-up might happen tomorrow. 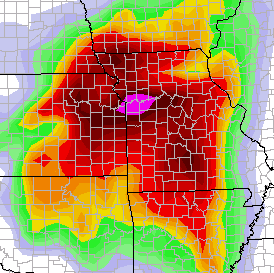 The chase zone would be right along or north of I-70 in a corridor from northeastern Kansas eastward into Missouri. You can read about the initial offering of this “Quick Shot” chase here. These are great chase opportunities because the time requirement is fairly small. For instance, I see the chase leaving Springfield in the early afternoon and then getting back into town no later than 1 a.m. The set-up includes a fairly unstable air mass building south of a weak temperature boundary. The disturbance in the upper atmosphere will provide just enough wind shear locally to perhaps put one or two storms in the supercell category. There is a weak cap in place, one of the questions would be whether this can be broken effectively. The storms would get going by say 6 p.m. and last past dark. We could effectively only chase up until about eight o’clock. If you would like to go on the tour, the cost is $199. A cash back system is in place which puts money back in you hands based on the number of people who go. The above-linked blog explains this in more detail. Send me an e-mail or contact me through social media if you want to go! I’ll make a final decision by late morning Monday. Improving conditions are expected in the Ozarks as we dry out and warm up over the next few days. Low clouds and some fog are still lingering over the area this Sunday morning. These will break by late morning and allow our temperatures to climb into the lower seventies over much of the Ozarks later this afternoon. Even warmer conditions are in store for us early in the week. Monday through Wednesday is a warm stretch for us with readings near 80° expected on Monday and Tuesday. Wednesday should be fairly warm as well. 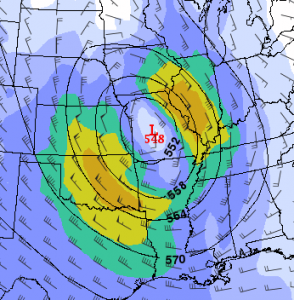 A big front will slide into the Ozarks late Wednesday. This is connected to a huge chuck of chilly air forecast to “cut-off” in the upper atmosphere late in the week and linger through the weekend. This features will cause highs to stall in the fifties on most days, maybe only forties in some areas and lows dropping into the thirties are possible. The exact nature of any frost potential will be determined by cloud cover and wind. If both are maintained through this period, the threat for widespread frost should be limited. It will be monitored for sure as of course the first of May is Wednesday! 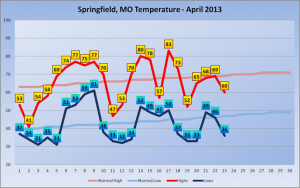 Springfield had a record 24 hour on Friday. More lighter showers are on tap for today. An upper level low will travel across Missouri and Arkansas today. Bands of light showers can be seen rotating around this feature and will be a part of the forecast for the remainder of today. 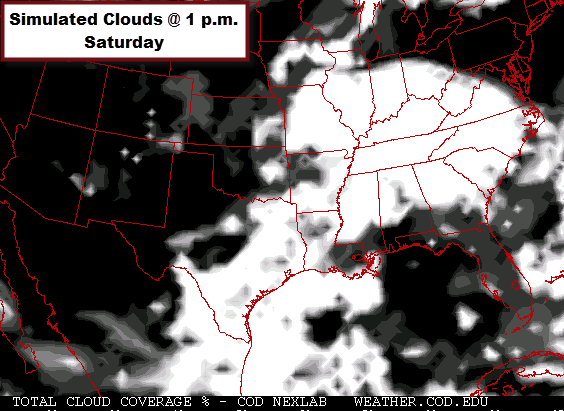 Clouds will also be the rule along with restricted temperatures in the fifties. 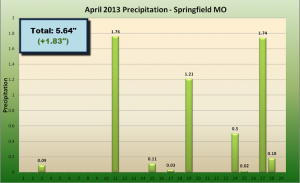 1.74″ of rain fell in Springfield midnight to midnight on Friday. This breaks the old record of .96″ in 1980. 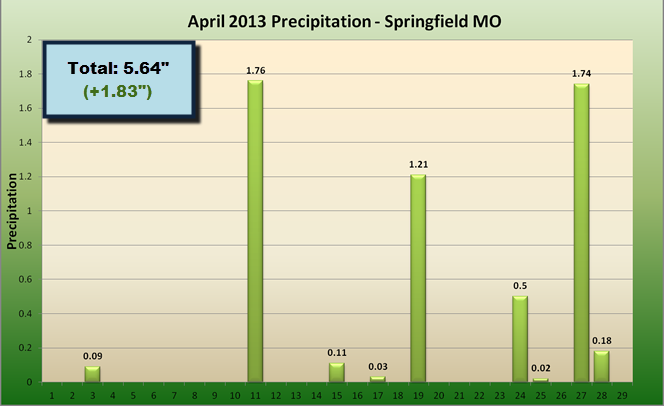 Our April total in Springfield now is a whopping 5.46″, well ahead of normal. 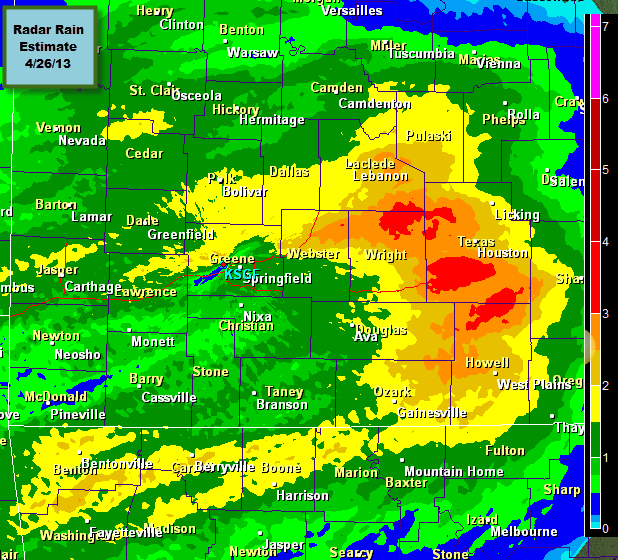 The insert shows radar rain estimates for the area ending this morning. The heaviest rain fell east of Springfield in portions of Wright, Texas and Howell Counties. Sunday looks brighter and warmer! I think lower seventies are possible across much of the area on Sunday. The seventies don’t stop there. Monday and Tuesday will be even warmer. In fact, I have eighty for a high on Tuesday! A cold front will eventually drop into the area on Wednesday. Showers and some thunderstorms will likely form with this feature. Colder air will once again drop into our area by late week. This looks like a possible extended period of much below average temperatures which will last into next weekend. Bands of rain and some thunder are making there way across the Ozarks this morning with more expected later today and tonight. This latest rain-maker is connected to a surge of warmer air not colder so this rain is different from some of the others we’ve had over the past several weeks. 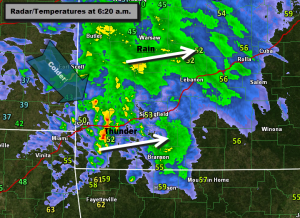 Rain is expected to continue through the morning hours in the Ozarks. I wouldn’t be surprised to see some small hail with some of the thunderstorms coming up from Oklahoma. 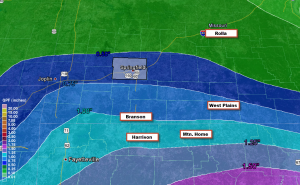 I’m expected rain totals anywhere from .50 – 1.00″ over the area with the potential for more in northern Arkansas. The threat for rain will continue tonight and even early on Saturday. While Saturday will be somewhat mild, it will be rather cloudy especially early. There may even be a wild rain shower possible Saturday afternoon. Sunday is shaping up with much more sunshine and warmer air. It begins a run of seventies that will likely take us into May! Temperatures are at or around freezing this morning leading to some scattered frost. A big rebound in temperature is expected today. The fourth shot of cold air this April will begin to leave today as daytime readings shoot into the sixties. On Friday, clouds and rain will set the temperature pattern back a few steps with many areas only reaching the fifties. The Friday rain seems to be shaping up to be a beneficial one. 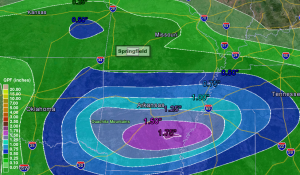 It looks like the Ozarks will receive anywhere from.25 to .75″ of rain. The heavier rain should target areas south of Springfield with northern Arkansas picking up the most. The weekend will progressively dry out and warm up! I see sixties on Saturday and seventies by Sunday. The pattern of even warmer weather should last into the first part of next week. A few upper seventies are possible. While light snow is showing up on radar and has been reported in portions of the Ozarks, upper seventies are also in the forecast! Yep, some light snow (and some rain mix) is passing mostly through areas north of Springfield. No significant accumulations are expected with this area but some of you will see it on the grass up north for a short time this morning. The temperatures will be cool for the season today, reaching only into the upper fifties. We are setting up a frosty condition for Thursday morning as temperatures hover around freezing once again. But also on Thursday is the beginning of a much warmer temperature pattern for the Ozarks. Sixties will come back for daytime highs on Thursday and will be replaced by seventies this weekend and to close out April! 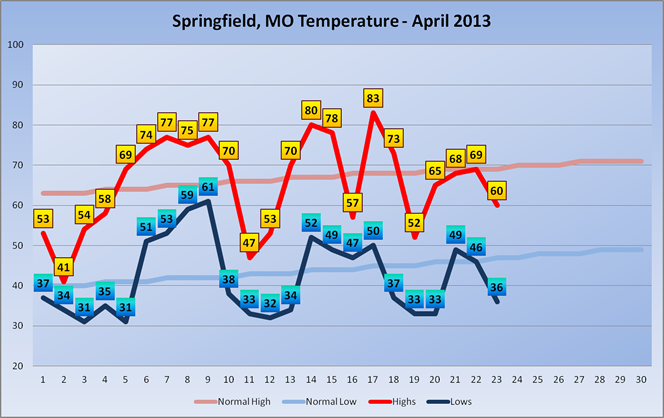 This is part of what has been a wavy, roller coaster ride on April temperatures as shown in the insert. Rain chances on Friday look pretty good as an upper level system (not connected to a cold front!) moves over increasingly rich humidity from the Gulf of Mexico. We should avoid severe weather and just get the rain benefit with this one! It might be another .50 to 1.00″ rain. Warmer temperatures should last into next week. The jet stream is retreating northward and stalling a bit next week. The result should be and extended period of warmer weather for the beginning of May! A steady rain has moved into the Ozarks this morning and the day will get progressively colder. In fact, snow is accumulating in portions of northwest Missouri! The air is much colder just northwest of us supporting snow in portions of Missouri and Kansas. We have the rain with some embedded thunder which will be around most of the morning. Our temperatures will start to tumble. Readings in the fifties this morning are as warm as we’ll see all day. By dinner, temperatures in Springfield will be in the lower forties. The light showers will last into the overnight hours. It’s not impossible for some snow flurries here in the Ozarks! It’s another few cold mornings for the Ozarks here in late April. Tonight, we’ll be near freezing but clouds and a breeze will actual help to deter widespread frost. The better chance might very well be on Thursday morning. Wednesday and Thursday look like pretty good days with sunshine and a slightly cool pattern for the time of year. 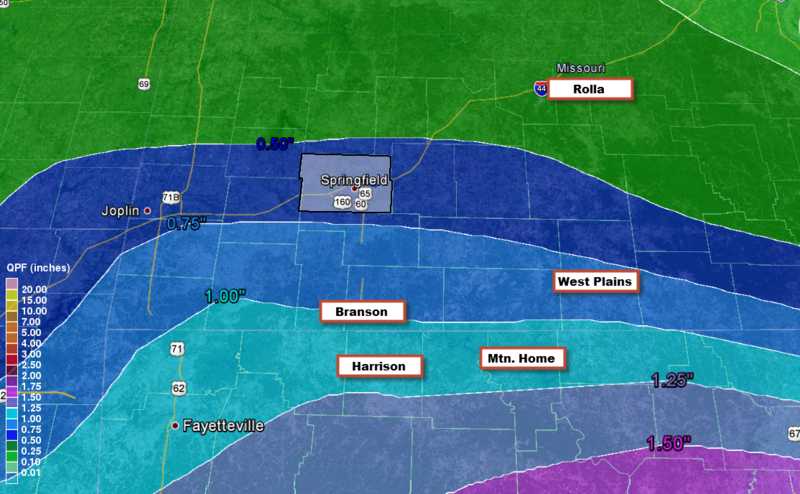 By Friday, I see more rain and perhaps some thunder rolling back through the Ozarks. The steady shots of rain are welcome! Some these showers might be around on Saturday. I think generally the weekend looks drier and warmer, a pattern which should last until Monday and beyond.